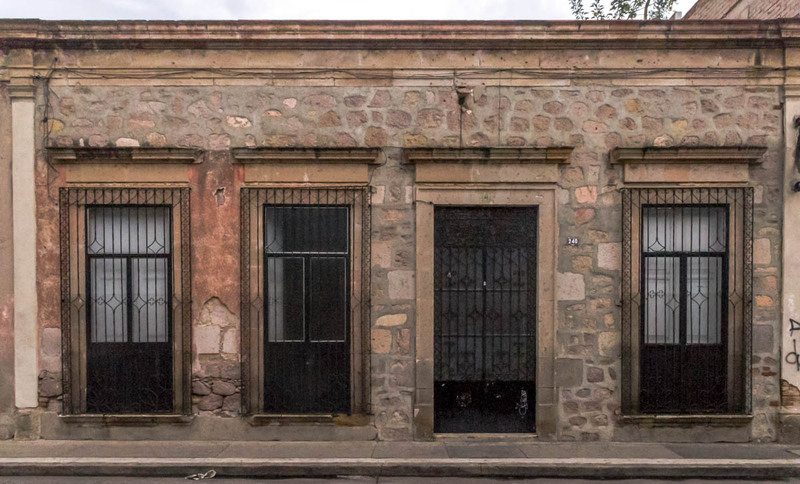 You cannot look at colonial buildings very long – and not see the extreme regularity and utility of design. Faced with very irregular, hand cut stones – builders used the limited regular accents they could find to guide the structure. In the top picture – the stones that shape the doorways also shape the window. The spacing between openings is an almost regular percentage of their size – as defined by those same stones that line the openings. The street slants down to the left so the window on the right is placed higher. It is likely the room on that end is actually a step up from the rest of the house. In the lower photo, faced with a length that was not evenly divisible, the builder hid extra space to the right of the doorway by making the space between the right window and the edge of the building the same as the spaces between other openings. The decorative lintels above the openings increase the apparent regularity. There is nothing wrong with this kind of design of course. For me, it is just interesting to see the elements of colonial design in these small, simple examples and consider how the same issues and responses to the availability of materials and labor impacted all designs in the period. If you are going to have one window frame and a set of shutters made, why not have all window frames and shutters made at the same time, in the same way? There were no big box hardware stores selling building supplies – but constraints assured each building was uniform within itself, regardless.